Issues for: v.2, no. 21; v.3, no. 14; v.4, no. 32, and; v.8, no. 3, omitted in numbering sequence and were not published. Issue for Feb. 27, 1981 called also v.3, no. 8, repeating numbering of previous issue. Issue for Nov. 12, 1982 called v.55, no. 46 in masthead, but constitutes v.4, no. 39, as stated in publisher's statement. Issues for Jan. 9 & 23, 1987 called v.9, no. 2 & 3, but constitute v.9, no. 1 & 2 respectively. \Rav Aluf Moshe Levy, the new IDF Chief of Staff. munity located at the JCC." ' the founding of the state. "died at Tel Aviv University. the results of our redeployment." River was an "open line,"
Chaim Herzog by Cabinet Secretary Dan Meridor. not left his home for over a week, is seriously ill.
Minister, raised questions of constitutional propriety. Hillel Graduates Where Are They Now? their families, and their school. merit from the student forum. the Hanegav Region of U.S. Y.
the Mercaz Sub Region of USY. EF Hutton & Company Inc.
During high school at Plant. on all levels at Rodeph Sbolom. * fcm To St JtMK-mo nom it. Kuth Levant, Audrey Quth, and Robin Hellwig. of women's support and contacts on a regular basis. Why It's Important To Usl"
"Wolcoroo Any Wort** Woman Who Would Llk To JotaU*. llMM Office MM Umtmif Blvd..
Haaaa aaad iilMlnllia (Farm ,i,.iiu .! ml p^n w TW Jtvtak fliriBii P.O. Ba. nan mm. rw*. i. States that did some tough talking. In case this was not dearly understood. succinctly: "The members of the U.S.
you sail into the sunset." tragedy, it makes us feel somewhat better. to become a main punching bag again. different in the usual UN Soap Opera mix. the CBS-TV "Face the Nation"
draw from the Shouf mountains. said, he has not been doing. 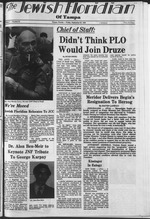 nomination in 1984. said the U.S.
do not want to leave Lebanon. peared on "Face the Nation,"
would be "close to criminal." warships was against those int"
security, a joint, a security. BONN (JTA) A number of militant neo-Na. of "Action for Repatriation of Foreigners" (AAR). which, compared to the AAR seems "moderate." Hesse constitution provides sufficient grounds for a ban. blow, it would surely not stand. are attacked was not a "threat." Mr. and Mrs. Sol Flelschman, Jr.
Mr. and Mrs. Lester Hlrsch. Jr.
Mr. and Mrs. Joel L. Wolf, Jr.
its chief leader in the country. picture-taking attraction transports 100guests at . stories high. Making several rotations in a lift. St. Petersburg Beach; a sister. Stanley. 41 at 471S JoMpo Court. Percy |R.. Ill.i announced here. he had complied with the request. all ten concerts. Some sections sold out. on the evening news on Rosh Hashanah. from Brooklyn, N.Y. in 1974.
member Shabbat in the Succoth. Fund raiser at Lake Forest Kol Ami Singles Dance 9 p.m.
p.m. Kol Ami Sisterhood Board meeting 8 p.m.
mittee 8 p.m. Tompa Jewish Federation 8 p.m.
Sholom Simchot Torch Services 7:30 p.m.
o.m. Rodeph Sholom Services 6 p. m.
Monthly Dance at Kol Ami -9 p.m. Admission $4. Cash Bar-$1. events for the upcoming months. the Hillel office at 968-7076. Plus'' of Mission Bell Place. Tompa, Canterbury School of St.
Dr. Cralg A. Newman, D.C. P.A. "leaks" to the media reduced. "I really do not believe that,"
munity in Lebanon,'' he added. its rose there is unclear. strength at about 5,000 roe,. 11433 N. DALE MABRY HWY. Silver Palm to all of these Florida hot spots? 1984. Other restrictions may apply. haven't discovered what traveling is all about.